April 10, 2017 / Ben M.
The Texas Rangers have lost 4 games and won 2; why do I feel so much better about the season right now? Joey Gallo: plate discipline is up, swinging strikes are down, and that's all it takes for Joey Gallo to do Joey Gallo things. I wasn't impressed with his approach in his first few at bats, but Gallo just took a deep breath, centered himself, and then did something different. That's the key, my friends. Saying Joey Gallo is a success if he hits the ball hard is not accurate. If Joey Gallo hits the ball right, then he's hitting the ball hard anyway. He's a monster. When Joey Gallo makes the pitcher throw HIS pitch, then Joey Gallo is a success. Gallo is batting .200, slugging .500, and after another couple of good games, he'll likely have an OPS approaching 1.000. Nomar Mazara: .417/.462/.750/1.212. Is he going to do this all year long? Of course not. But misplaying fly balls and running when you shouldn't (he'll learn, this guy is YOUNG) can be forgiven when you're batting enough for two people. Carlos Gomez: His bat isn't so hot, but it's as good as Ian Desmond's second half last year, and the defense is better. For much less money. Plus, we know the bat is still in there somewhere. Rougned Odor: .318/.348/.773/1.121. And he does it while being Rougned Odor, which is a plus. Elvis Andrus: OPS over .900, which somewhat negates the need for dazzling glove work. Elvis's glove has been fair to middling and occasionally sparkling, so we'll just have to see what we end up with. Robinson Chirinos: "Hey, Robbie, get in there and just do what you do. Make Martin Perez better, hit for power." "Yeah, boss." Does it. 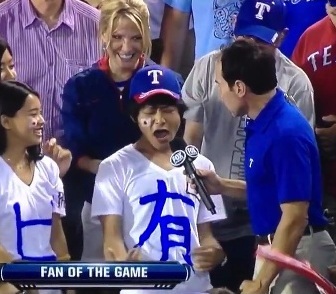 Yu Darvish: Hey, would you believe a huge number of Rangers fans, including people who write regularly about the team, still think Darvish is an overhyped, prima donna bum? I'm on board with Texas trading him, now....just so people will STOP WHINING about the guy. Darvish is a Top of the Rotation pitcher on any team that doesn't have Clayton Kershaw, or whoever is having his one-off Cy Young year. I suspect he looks so bad to people when he's "off", only because he looks so good when he's on. We've heard for a couple of years now, when Cole Hamels is "off", that he still finds a way to get 18 - 20 outs, limit runs (sometimes) and keep his team in the game (sometimes). "That's the definition of an Ace, right there, ya sumbitches!" Yeah, well, it's also the definition of Yu Darvish in the MLB. I guess I'll just say that Hamels's situation is "developing". My best case prediction is that he'll do about what he did last year, except he'll have 1 or 2 fewer good games. Which will make him a pretty decent pitcher. Martin Perez: Martin Perez is the best pitcher on the Texas Starting Pitcher staff after one week. If he did this in every start, and made every start (he will do neither), he would be a 9 bWAR pitcher and a controversial Cy Young winner, probably. The good news is that when you regress him back a bit, and figure the negative bits of his game will player a bigger role, then maybe Perez will still be a 3 or 4 WAR pitcher for Texas this year...which is EXACTLY what they expect and want from him. That's all of the really good stuff. I know people want to grouse about the bullpen, but the bottom line is "It is what it is". I don't like the closer role, but Jeff Banister does, and by all accounts buys into the psychological part of "being a closer". Ergo, Sam Dyson will be the closer until Jeff Banister believes his ego is crushed (never mind his arm). I don't get it, but that's how Banister rolls his bullpen. Bush is good. Jeffress seems locked in, and can probably do a lot more than he's been doing...but that's up to the manager. Claudio...man, he really has made an art form of multi-inning relief. That's something that Texas has clearly tried to develop with a handful of of their relievers...and if you haven't noticed, it's something that's becoming more prominent throughout MLB (Trevor Bauer, anyone?) Claudio and Barnette have both proven out what I wrote last year in some of my xFIP posts: they're both much better than their reputation, and their appearance. If only Banister would do with closer what he's doing with the rest of the bullpen. Say, with Jose Leclerc, the man who owns a .273 WHIP, 12.3K/9, and NO WALKS. That sounds like closer to me. Hm. So I guess I wrote about the bullpen anyway. Napoli: I suspect he'll keep doing what he's been doing (hit a dinger a week) with bad 1B defense. He'll go the DL eventually, possibly the 60 day and his year will be over. I suspect he's already hurt, based on how he's moving. Could be wrong. I also suspect, despite media reports, Texas didn't try all that hard to sign Napoli, but there was enough doubt in the slugging department that when he got cheaper than anyone ever thought, Daniels just said "what the hell" and called his agent. Choo: He'll either come around, or he won't. Probably he'll be hurt soon. This is his fourth year with Texas; he's signed for three after this. And like Josh Hamilton, I just don't see how he contributes all that much from this point onward. He's been hurt more than I think anyone really foresaw, except for some guy in the comments section somewhere who said it from the time Choo was signed. Lucroy: Now would be a good time to sign him to an extension. I would go five years, but it would have to be creative to be worth the money. Catchers carry a lot of risk, but it's Lucroy's bat that gets cold, not his hands or mind. Just my 2 cents. Also, no; I don't seriously think Lucroy will be a drag on the team all year. But he sure has stunk so far. Beltre: Doesn't belong on this list. Did I miss anyone? Disagree? Let me hear it.